This year my husband and I reached our 20th marriage milestone! Without my knowledge, he planned a surprise trip to Scotland for us. We are just a $200 plane ticket and 5 hours away, as we live in the Middle East, so he decided this was something to celebrate big this year! 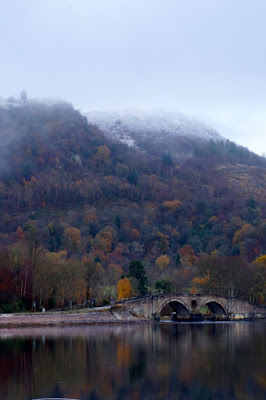 Rather than visit the traditional big cities of the country, we drove out to Inverary, where our ancestors once lived. The night drive was in the dark on the "other" side of the road! But the next morning, we awoke to scenes such as this photograph. I had a hard time choosing which photo to use, as the sights around us were all breathtaking. I could not stop smiling! It was a pleasant surprise to see Fall all around us still, though we were so far north. We married in the Fall, my favorite season. And God left Fall beauty there for me to see it. This stone bridge stands just in front of the Campbell castle, still inhabited by the Earl himself. As my marriage grows and my children grown, I'd rather spend money on memories than on things. This trip was a gift I'll never forget. Copyright © 2016 by Sara Campbell. All rights reserved.